Christmas Live Wallpaper is an amazing quality active wallpaper. Enjoy Christmas each time you use your phone! The application has a very high quality graphics, all the details are worked out at the highest level. High resolution used elements allows for the use of wallpaper without loss of quality even on tablets. 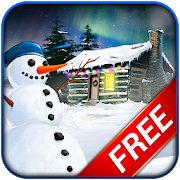 Enjoy this magic winter landscape in his purest style and if you have lucky the Yeti will appear… In addition, the parallax effect, flying clouds on a background of glowing stars and auroras on the sky makes this application a perfect gadget for winter days.